Apologies that this letter was not issued at the end of school today. 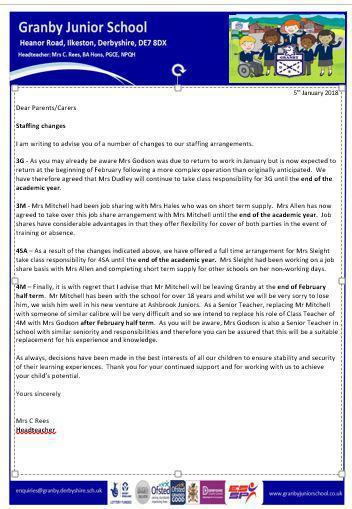 Please see below letter regarding staffing changes (hard copies will be sent home on Monday 8th January 2018). I am writing to advise you of a number of changes to our staffing arrangements. 3G - As you may already be aware Mrs Godson was due to return to work in January but is now expected to return at the beginning of February following a more complex operation than originally anticipated. We have therefore agreed that Mrs Dudley will continue to take class responsibility for 3G until the end of the academic year. 3M - Mrs Mitchell had been job sharing with Mrs Hales who was on short term supply. Mrs Allen has now agreed to take over this job share arrangement with Mrs Mitchell until the end of the academic year. Job shares have considerable advantages in that they offer flexibility for cover of both parties in the event of training or absence. 4SA – As a result of the changes indicated above, we have offered a full time arrangement for Mrs Sleight take class responsibility for 4SA until the end of the academic year. Mrs Sleight had been working on a job share basis with Mrs Allen and completing short term supply for other schools on her non-working days. 4M – Finally, it is with regret that I advise that Mr Mitchell will be leaving Granby at the end of February half term. Mr Mitchell has been with the school for over 18 years and whilst we will be very sorry to lose him, we wish him well in his new venture at Ashbrook Juniors. As a Senior Teacher, replacing Mr Mitchell with someone of similar calibre will be very difficult and so we intend to replace his role of Class Teacher of 4M with Mrs Godson after February half term. As you will be aware, Mrs Godson is also a Senior Teacher in school with similar seniority and responsibilities and therefore you can be assured that this will be a suitable replacement for his experience and knowledge. As always, decisions have been made in the best interests of all our children to ensure stability and security of their learning experiences. Thank you for your continued support and for working with us to achieve your child’s potential.